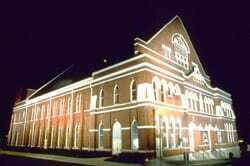 Nashville’s historic Ryman Auditorium has once again been voted Best Music Venue by Tennessean readers choice poll, Toast of Music City. The announcement was made last night (7/21) during a special ceremony held at the War Memorial Auditorium. The historically cool Ryman has a full calendar of a variety of upcoming events including Crowded House, August 2; Natalie Merchant, August 29; indie-veterans The Pixies on September 10 and 11; and country music’s “Gentle Giant” Don Williams, October 20 and 21. A complete schedule of events can be found at www.ryman.com.